I came across a need to implement a search based on zip code, latitude, longitude, and a radius. I quickly found out that this is a tall order in a short amount of time if implementing this type of functionality from scratch. However, the Lucene Spatial Search Support module came to the rescue…or did it? I am implementing a Sitecore 8.1 instance and it looks like the module was only good through 7.5 at the time of this post. There is an option to use SOLR Spatial Search Support module, and that IS updated through 8.1, but I didn’t have a driving need for SOLR on this project since my records being indexed were low in nature. So what is a Sitecore developer to do? Luckily, the Lucene Spatial Search Support module source code was available on GitHub, so I set out to get this module upgraded to 8.1. Time to get our hands dirty! Now it was time to make sure that the Sitecore.ContentSearch.Spatial.config was configured properly for 8.1. To my joy, it looks like there is a .config setup for version 8 that is disabled when I pulled from GitHub. I disabled Sitecore.ContentSearch.Spatial.config and enabled Sitecore.ContentSearch.Spatial.v8.config. Next, I added in my template criteria for my locations with the Template ID, LatitudeField, and LongitudeFields and then modified the index to use “sitecore_master_index” since I am testing this out locally and in live mode. After some research, I realized that my index was set to use the wrong index earlier in code. Not only that, but one that wasn’t setup properly to for spatial search at all. After pointing to the correct index, publishing from Visual Studio, and then rebuilding my “sitecore_master_index” I was getting results back. As I stated earlier, you can also perform spatial search with SOLR. If you have a client that has this type of environment (which is most right!? ), I would take a hard look at SOLR for your client’s search provider. Solr supports calls over HTTP(S) which means that the indexes are available to all servers in the environment that require it (content management and processing servers). Big shout out to Ahmed Okour for the help that he provided for questions I had during the process. Happy coding! This entry was posted in Lucene Search, Sitecore Marketplace Modules and tagged 8.1, lucene, search, sitecore, spatial on January 5, 2017 by Toby Gutierrez. Below is a LIVING list of helpful troubleshooting tips to fixing Sitecore issues. Meaning, these are tips that Sitecore developers typically will run through before going to the Sitecore Community and/or Sitecore Support. If a tip is not in this list, feel free to comment and I will add it to this running list. Check the Sitecore Logs for errors located in the Data/Logs folder. It’s a best practice to have the Data folder as sibling to the Website folder and not inside the Website folder. Using Chrome’s Web Developer tool you can check the Network tab, or in Firefox Firebug use the Profile button to see if anything is failing with when being loaded or events are firing etc. See if the issue is browser specific by using different browsers (IE, Firefox, Chrome). Debug with Visual Studio for ASP.NET/C# issues. If .dll issue take a look at the .dll in .NET Reflector, or similar reflection tool, and see what the code is setup to do. This might lead you in the direction of the issue. Try recycling the app pool for the website. If missing files/items see if a previous package was installed and reinstall to pick up the files/items. Is the issue environmental, meaning works in one Sitecore instance locally, but not in staging/production? If so, what could be the difference in files/items/configuration you can compare that will give you direction to solve the problem. You may need to use a tool like Beyond Compare, or similar tool, to diff some files to get to the root of the issue. Thanks in advance for any helpful tips to help out the Sitecore community! Happy coding! This entry was posted in Sitecore Bugs and tagged sitecore, tips, troubleshooting on December 11, 2015 by Toby Gutierrez. At the end of the year 2014 when the Sitecore MVP’s were awarded their MVP status, it was then that I decided I wanted to become a Sitecore MVP. Below are some simple steps that I used to obtain my Sitecore MVP status for 2015 in as little as 30 minutes a day, which is 2.5 hours a week added on to your daily/weekly routine. It’s all about passion and consistency! When you walk into the gym you will almost always see the guys that are bigger and ripped. So you ask yourself, “What are they doing to get that size and definition?” Yes, they could be on steroids, which is what most believe, but I assert that’s not the case. More often than not, they have just made it a habit to show up every day, and made it a point to not let anyone else outwork them in the gym. It’s their passion, and they are consistent in showing up and working hard 5-6 days a week to reach their bodybuilding goals. Becoming a Sitecore MVP is very similar to bodybuilding in the aspect that it’s much easier and less stressful to work on your MVP status daily/weekly. This is a much better strategy than waiting until nominations come around in October/November of every year to start getting to work on the MVP award. 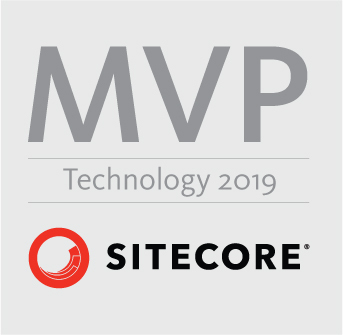 That can be time-consuming and stressful if you need to play catch up on a lot of the things that Sitecore is looking for to reward you with the MVP award. To make this even more clear, if you relate this to bodybuilding, that’s like walking into the gym after you haven’t worked out all year long and stacking 500 pounds on chest press, and going for it. It’s just not a smart idea! Consistency and involvement is key and I will give you some pointers on where you should spend your time below to help you in your quest to become a Sitecore MVP. I still remember about 6 years ago when I was the Lone Ranger in my company that just got a license for Sitecore. I was tasked with learning and becoming the sole developer/resident expert on Sitecore 6.0. At that time, I was a complete Sitecore rookie, and my only source of knowledge was the documentation that Sitecore provided on the SDN. Back then there wasn’t much for Google searches when it came to troubleshooting. I struggled to take in all the information and learn on my own, but I was determined to rise up as a solid Sitecore developer. It was at that time that I vowed that should I ever become knowledgeable with the product that I would help others in the Lone Ranger situation. Hence, the reason I share my knowledge today, which is to share and give back to the Sitecore community as they have given back to me in my time of need. Start with a selfless heart when seeking to obtain the Sitecore MVP status. Realize that most of the MVP’s would probably still do all these things even if there wasn’t an MVP program. It’s just a unique character attribute to possess where you want to help others and not keep all this information to yourself. Nothing is free. If you want to become a Sitecore MVP or a have a healthy, fit body you simply have to commit to how much time you are going to spend to obtain that which you seek. What I do every morning is try to wake up about 30 minutes early before work and focus on those contributions above that can help the Sitecore community. Once you have a time commitment you can then decide where to spend that time. Jump on the Sitecore Community forums and/or Stack Overflow and help others to work through their issues. You may not know the answer, but maybe you can help lead someone in the right direction. Try answering the issues or offering input where you can with your knowledge and experience. It all helps even to stir up thought that may help that person reach a final solution. Make sure to set up your notifications to come directly to your email inbox so you can see what’s new and respond promptly to ones that you previously were helping with. Use this time to blog on a topic that you find would help the Sitecore community. I usually have found that as I am working through my normal work, I have these moments where I say to myself, “I bet others could benefit from what I just went through.” And that is the starting point of a new blog that I start while it’s still fresh in my mind. So as you are working always be thinking of what it is that you’re doing that could help others. Use this time to build a Sitecore Marketplace module. If different clients are asking for the same type of component or module and it’s not on the Sitecore marketplace consider developing a Sitecore marketplace module. Chances are that other Sitecore clients will want to use it. Just be ready to support it as well i.e. bugs, new features, updating to work with newer releases of Sitecore. In addition, to what is above that you can spend 30 minutes a day on you should also get involved in the social Sitecore community via Twitter and Slack. Slack is used to bounce ideas around on the Sitecore Slack channel. Great to see what other Sitecore developers are talking about and get involved. What’s best about slack is it’s real-time chat with other Sitecore developers from around the world! If you live in a state where you have a Sitecore User Group that meets regularly get involved! Definitely show up to the meetings on a regular basis but if there is something you would like to present on then let the User Group leader know. For those of us, that live in areas where there is not a Sitecore User Group consider starting one up. Here is a link to the Sitecore User Groups directory. Here you can see where a User Group is located near you. For us that live in disparate areas, there is a Sitecore Virtual User Group but it’s based on presenters. No presenters, no meeting. Hence, another area where you can pitch in and contribute towards becoming an MVP if you feel comfortable enough to present on a topic. Lastly, as you go about your day and encounter issues with Sitecore that can’t be resolved with your technical ability and the help of Google, then consider putting in a support ticket to Sitecore Support. Again, chances are it’s a bug that needs to be addressed and fixed in the next release. Sitecore wants to know about all these bugs so don’t think you’re being a pain in the neck, it’s helping them to build the most solid, robust, enterprise level CMS system in the world. So remember, do it because Sitecore is your passion and you love to share NOT because you have to. Next, set aside time each day to make it simple and easy for yourself to reach your goal of MVP. Lastly work your plan daily/weekly to share to the best of YOUR abilities with your knowledge and expertise. Happy coding! This entry was posted in Did you know... and tagged how to become siteocore mvp, sitecore, sitecore mvp, steps for sitecore mvp on October 15, 2015 by Toby Gutierrez.